Champagne punch is the perfect cocktail for any occasion - from backyard barbecues to bridal showers and formal holiday dinners. Champagne punch is a light, fruity drink that isn't too sweet and isn't too strong. There aren't any ingredients that you have to add to Champagne punch, not even the Champagne! Sparkling wine will do just fine, it's less expensive and nobody will even know the difference. 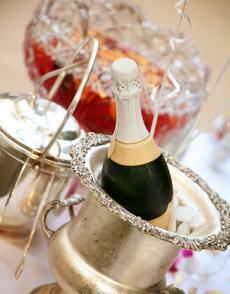 Champagne - As mentioned above, less expensive sparkling wine is a perfect substitute. A bit of liquor - Rum is generally used, but liquors like Curacao, Chambord, Grand Marnier or Cointreau are also great additions. A carbonated beverage - This can be ginger ale, flavored carbonated water, soda water or tonic. Fruit juice - You can choose from frozen fruit juice concentrate or fresh squeezed fruit juice. With so many great Champagne punch recipes floating around, it's difficult to decide on the best ones. Below are a few standout recipes. Mix the ingredients together in a punch bowl and top with soda water before serving. 1 liter of carbonated water. Mix all the ingredients together in a punch bowl. Float the lime and lemon slices on top of the punch for a garnish. Mix all the ingredients together in a punch bowl and serve in Champagne flutes garnished with an orange slice. Perfect for a Sunday brunch. It is so easy to invent your own Champagne punch. All you have to do is think of two or more types of fruit that compliment one another and go from there. Puree both the frozen strawberries and raspberries then mix the pureed fruit with the Champagne, flavored vodka and sparkling water in a large punch bowl. Float the fresh raspberries and sliced strawberries on top for a garnish. If you want to add another flavor that would go well with this punch, try a little blueberry flavored vodka and float a few fresh blueberries on top. Don't be afraid to experiment with different fruit flavors when trying to create your signature Champagne punch. Also, don't forget about the look and feel of the final product - after all we eat (and drink) with our eyes first.